West Winds Men's Shed & Channel Men's Shed have agreed to host the next Southern Sheds Representative Gathering on Friday 30 November. Welcome Southern Shed presidents/representatives to the Southern Sheds' Quarterly(?) Gathering. To assist with catering and manning the Channel Mens' Shed walk about, RSVP will be much appreciated. The Gathering and luncheon will be held at West Winds Community Centre, 3528 Channel Highway Woodbridge [mud map for parking location below] followed by a visit to Channel Mens' Shed to round out the day. Arrivals with casual chat and coffee set for 9:15AM for a 9:45AM start. While the format of the morning will be, as usual, a friendly with a round table update from Sheds attending. 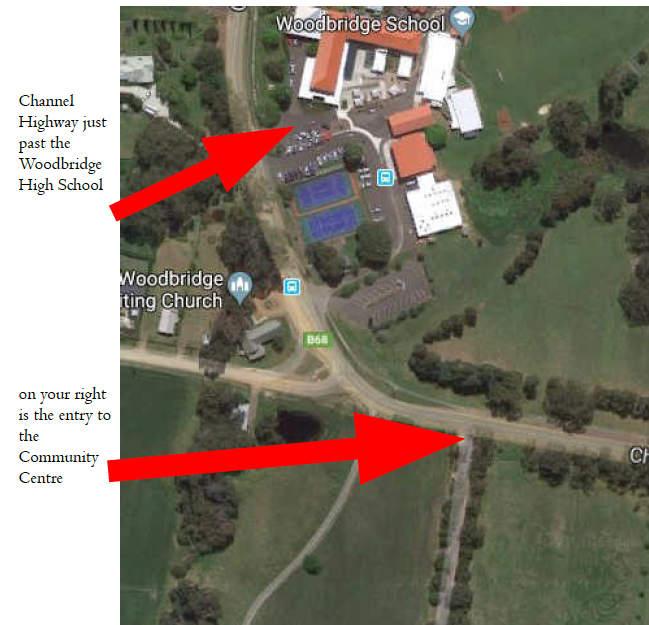 Channel and Woodbridge would like to gauge the future direction of these meetings and have brainstormed (with TMSA) a couple of topics for consideration as time permits. What have Sheds taken away from previous meetings and are considering implementing? Is it appropriate to have an invited Speaker and if so, what are the topics Shed would consider relevant to their efforts? Are formal reports on developments in individual Sheds required or should it remain on an informal round table basis. Do we have another one and if so, who will host? Luncheon is scheduled from 12 until about 1:30PM when all those interested will depart for Channel Mens' Shed at Van Morey Road Margate for a more or less casual walk around and discussion with a couple of that Shed's members and committee. We would envisage wrap up at somewhere between 4:00 and 4:30PM so that attendees can beat peak hour on their way home. Attached is a map of West Winds location at Woodbridge.